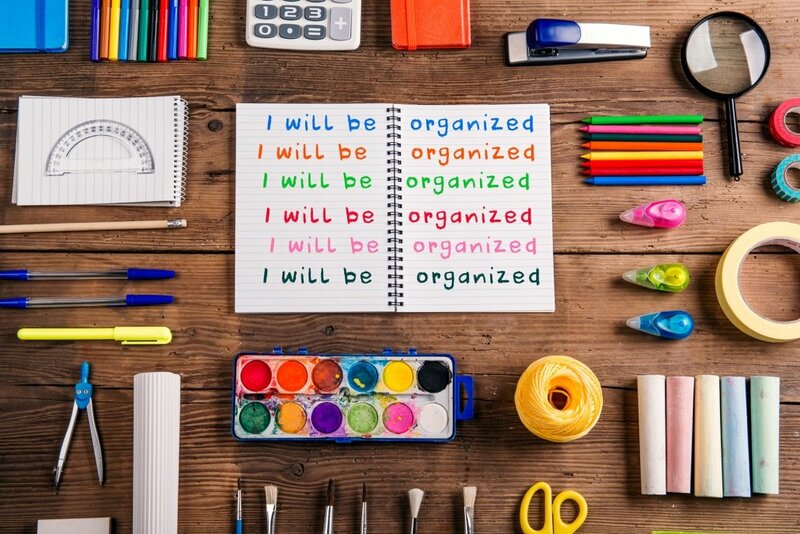 Organizational skills are important, whether we are professionals in the work force, parents, teenagers or children. Mastering this life skill will be valuable in every phase of our lives. It is never too late to evaluate how your child is doing in enhancing this skill and help them develop the necessary strategies to be successful. When it comes to be organized, I firmly believe we all have the best of intentions. I have yet to meet a student who wants to fail or be the student who doesn’t turn in their homework. Just like with adults, children’s good intentions may not always yield good results. Parents can start with children as young as 2 or 3 years old. Developing organizational skills is much like learning to ride a bike. We don’t just sit our children on the seat of a bike and let them go. We hold the seat of their bike until they seem sturdy. Even then, we often run beside them to catch them if they lose their balance. The same strategy should be used in teaching our children organizational skills. In the beginning of the process a parent should be very involved. As they are ready for more independence, children can be given more responsibility and the parent can become more of a monitor. The academic setting is the perfect place to begin teaching these life skills that can be carried over throughout a lifetime. A key component is allowing a child to develop an organizational system that makes sense to them. What may seem to make the most sense to you may not be what makes sense to your child. Therefore, allow your child to have ownership as you guide them by gently pointing out suggestions and potential pitfalls of their plan. Begin with consistency at home. Having a set study time after school will provide a consistent routine that promotes good time management. Aid your child in organizing their backpack and binder to provide a system that prevents papers from being shoved into books, etc. Strongly support your child using his/her agenda. Developing the habit of writing down assignments/tests/events in the agenda as soon as the teacher assigns it in class will set them up for success. This habit will lead to independent success in the academic years to follow. This task is often overlooked by students as they get busy or distracted and forget to write things down. This step is extremely important, so you may consider a reward system in the initial phase of developing this strategy that supports creating the habit. Create a to-do list and break down big projects into smaller tasks. In a different color ink, fill in extra-curricular plans to help your child plan in advance to avoid evenings which will not allow enough time to accomplish the necessary tasks. As Donna Goldberg from the NYU Child Study Center emphasizes the importance of these skills, she clarifies the need for students with special needs in particular. Children with attention difficulties often miss details and find organization difficult. Those with executive functioning issues often have trouble with prioritizing and sequencing. Children with auditory processing difficulties often don’t take in everything that is being taught. Recognizing your child’s individual needs and teaching them how to compensate with organizational skills will be a lesson leading to success for a lifetime.